"This is a very simple recipe for cinnamon-flavored croutons. They are delicious with a salad that includes fresh fruit, such as pears or strawberries!" 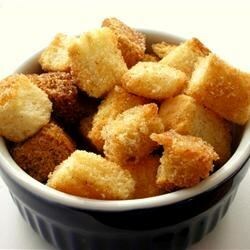 See how to make simple, inexpensive homemade croutons. Delicious! I melted the butter, tossed with the bread cubes then shook it in a bag with the cinnamon sugar. Served this atop "Strawberry Romaine Salad II".